I guess this cute jewelry minder is for Valentine's Day at Target. I never saw it before and only 1 on my local Target's shelf!! It wasn't expensive at all. 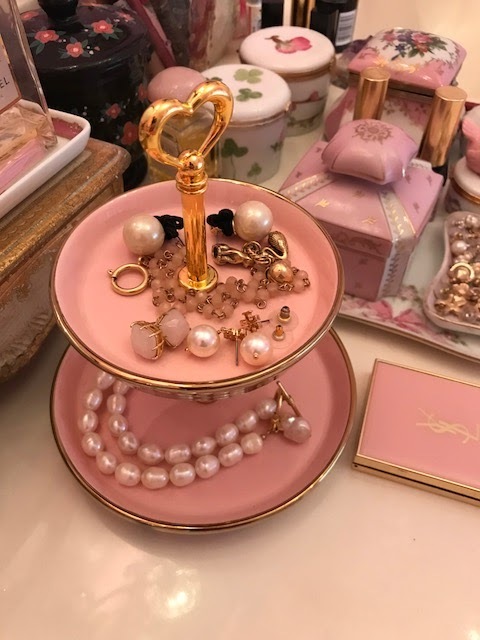 Cute way to organize jewelry! Pink girl's monogram C'est chic ! In order to make reality more endurable we are obliged to encourage in ourselves a few small eccentricities. Laduree one of my favorite places! My dream cake a la peony! D' avantage est rarement suffisant. Do Tell peony a favorite! The 18th century in Paris " A time when the superfluous was essential"
My delightful blog friends -- your comments are such a lovely perk! The girls in their pink stroller! Pink love is in the air! MA Petit Trianon teacup-- tres moi! At Petit Hameau-quels sont ces? Pink chou-- I love them!! My amie Minnie at Disney World. She is tres chic in kimono! Beginning to look like Valentine's Day! I'm just a girl from the South with an eye for pink and for pretty homes and gardens. I love to travel and I love France. I have lots of hobbies and love meeting new people. I love art,pastry making, ballet, reading, gardening,dancing and being with friends and with my dogs, cat and pink parakeets.